In an unexpected announcement, Apple issued a warning on Wednesday that it was aiming to achieve $84 billion in revenue in its upcoming quarterly results report, down from originally forecast numbers of between $89 billion and $93 billion. In the letter to investors, Apple CEO Tim Cook advised of fewer iPhone upgrades than anticipated, with "foreign exchange headwinds" from a strong U.S. Dollar and "economic weakness in some emerging markets" cited as reasons for the reduction. One major stretch of text in the letter also blamed the lower-than-anticipated iPhone revenue "primarily in Greater China" as a primary cause of the shortfall. Even so, Cook noted revenue from non-iPhone business grew by almost 19 percent year-on-year, while also highlighting all-time revenue records being set in a number of developed markets. While Apple is still continuing to produce sky-high revenues, the wobble has prompted a deluge of commentary from analysts giving their opinion on the matter. As to be expected, the pessimism is palpable. The news is a "major black eye" for the iPhone maker, according to Dan Ives of Wedbush Securities speaking to CNBC, declaring "It's a dark day for Apple and bulls." 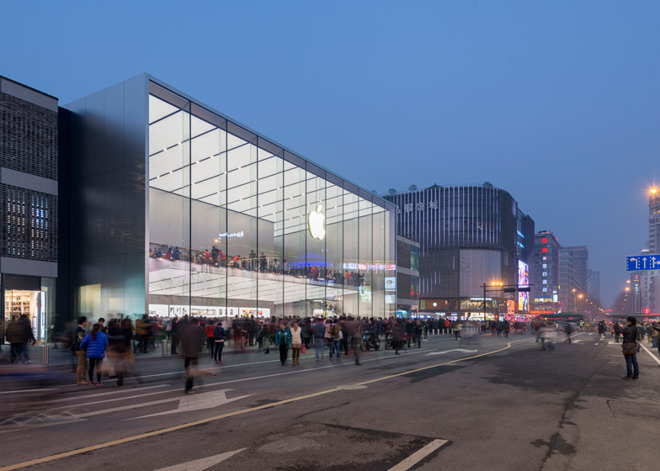 Chinese demand will be a focus for Apple in the next few quarters, suggests Ives, adding "The degree of softness that we're seeing in China is a bit of a jaw dropper." While he feels there are many questions that will rise up about what Apple will do in the future, such as if prices will be cut and if this will be a two or three-quarter "massive downtick," Ives believes it will all be down to Cook's decisions. "This, in my opinion, for Cook will be a defining period, how he and the company handle it specifically around metrics and China demand." Wedbush cut its price target from $275 to $200. The trajectory of Chinese demand in early 2019 may further affect the rest of the year's figures, Rod Hall of Goldman Sachs suggests. It is proposed Apple may have to reduce its projected numbers for the fiscal year further, but at the risk of hitting its share value. "We have been flagging China demand issues since late September and Apple's guidance cut confirms our view" Hall writes in the note to investors. "We do not expect the situation to get better in March and would remain cautious on the region." The analyst also compared Apple to the rise and fall of Nokia, noting the nordic phone producer's reliance of replacement upgrades "well beyond what any linear forecast would have implied" in late 2007, raising it as a cautionary tale for Apple's reliance on consumer iPhone upgrades. Goldman Sachs reduced its price target from $182 to $140 on the news. The lengthening of smartphone cycles is seen as a major contributor to Apple's woes, according to a Morgan Stanley note, with the "improved smartphone product quality" and longer useful lives joined by a weakening economy in affecting Apple. This and the China result led the firm to cut its price target to $211 from $236, and reduce its FY19 iPhone units target by 20 million to 180.25 million, effectively a 17 percent year-on-year reduction. On China specifically, the firm's own analysis of shipment data "suggests that for the broader China smartphone market, replacement cycles have lengthened materially in the past two years, and even more so for Apple." A 22 percent rise in smartphone average selling prices in two years and a lack of carrier subsidies also contributed to the China situation. The guidance revision "follows an already disappointing F1Q19 revenue guide issued in early November," JP Morgan's note reads. While other headwinds tracked with expectations, the preliminary results "tracked substantially lower than guidance led by greater economic weakness in EMs and fewer phone upgrades in DMs." The relatively high price target of $266 was reduced down to a still respectable $228. The release of the guidance "implied China revenue declined 25-30 percent year-on-year," suggests UBS, "declines last seen during the iPhone 6S cycle due at the time to very tough iPhone 6 comps." As a result, the price target is cut from $210 to $180. While down on Apple's iPhone revenue, UBS does advise there is an "important silver lining" in the form of Apple's Services business, with revenue of $10.8 billion approximately half a billion above UBS' model. It also notes that, despite revenue being down, the gross margin of 38 percent is still within its guide range, albeit at the low end. The "rapidly deteriorating" business in China and revised outlook for iPhone "materially worse than our below-consensus estimates" has prompted Jeffries to not only cut its price target from $225 to $160, but also to downgrade the stock to "Hold." "We still think Apple can build a massive Services business over time," adds the company, "but Apple hasn't missed its guide in years, so the extent of this miss suggests it is navigating uncharted waters." "We move to the sidelines and wait for clarity as uncertainty grows around the hardware business." Another that has decided to downgrade Apple, this time to "neutral," Macquarie has plunged its price target down from the already-cautious $188 to the extremely low $149. "The bottom line is that we are late (obviously), but we can no longer recommend AAPL," writes the firm in its note. "Fears about iPhone have been confirmed, uncertainty about the severity and duration of iPhone troubles will linger, and the other shoe is about to drop on Services growth, particularly for its highest margin drivers." After representing 18 percent of total sales in the last quarter, Citi suggests China's percentage is now closer to 10 to 12 percent. Despite having a financial model below consensus, Citi has lowered it again, downshifting the target price from $200 to $170. "We do not expect much positive news until after earnings slated for late January and even the focus will be how low can sales go," writes the firm, suggesting a 5 percent year-on-year shrink and a projected 2 percent contraction in March. "We don't expect any rally in the shares in the near term until consensus get materially reset lower and trade wars get resolved." Cutting the price target from $222 to $187, Piper Jaffray notes it has reduced its full year 2019 and 2020 iPhone units estimates, but at the same time raising estimates for non-iPhone revenue, including Services, Mac, and wearables. "The end result is FY19 and 20 estimated revenue comes down by 6 percent and 4 percent respectively in our model." The price target cut is said to reflect both lowered earnings per share estimates and a "slightly reduced PT multiple." Apple's revelation of the revenue decline being caused through weakness in Greater China across iPhone, iPad, and Mac markets leaves Wells Fargo to "question the impact of the US-China trade situation." Noting the anticipation of "weaker-than-expected iPhone results" since November, the firm's industry checks leads it to believe "demand weakness, coupled with channel inventory burn-off, could persist for a few quarters." Street expectations were thought to be in the low 70 million unit range, but are now down to around 65 million units following the news. Wells Fargo cut its price target from $210 to $160. Funny seeing them pat themselves on the back for finally being right for once. As if they suddenly got back all their credibility after years and years of begging totally wrong. If a habitual liar told me something that was true, should I assume they’ve changed and now trust what they say in the future? ... this is not an iPhone pricing issue nor an iPhone lifecycle issue. It IS a China issue, both their economy and the incipient trade war. Am I the only one who sees these guesstimates as self-fulfilling prophecies? "Since Apple revised its revenue guidance on Wednesday, analysts have been quick to jump on the news with their opinions on the lower-than-expected iPhone sales and reduced revenues primarily from the Chinese market." Couldn't you say the same thing about AI? The range of the price guidance across these firms is huge. One cuts their price from $275 (!!) to $200, while another goes from $182 to $140? Nokia analogy, really Rod @ Goldman? Either your tech acumen is poor or you wish to fan flames for higher alpha. I think it would be great if AppleInsider could get a HongKong/China based writer. Someone who could provide more insight to what’s one of the biggest IPhone markets and also develop sources into the supply chain. When did business in China begin dropping off? Was it before the Oct-Dec quarter, in October, or when Meng Wenzhou was detained. I wonder how this affects google (probably not much). I've taken a quick look around to see where Apple has actually broken out revenue by country to confirm the issue is mainly China. I've not found anything for the first quarter 2019. I have seen charts looking back and the big dip in China came 2015-2017. Besides China, Apple noted that the issues was partly due to low cost of battery replacements, people have not been upgrading. But how do they know that? Where's the data? We know people are not upgrading. Apple said it. But instead of the battery issue, could it be higher prices? We'll soon know as the low cost battery replacement program is ending. As Warren Buffett says, invest in what you know. I've been an Apple fan for years, but what I know is I won't buy an iPhone for much over $600. I know I'm not alone. When I asked my college aged daughter if she wanted to replace her iPhone 6 for Christmas, she said no. "They cost too much now, Dad." She is right. Apple disappointed the public with their earnings report. For me it was a double disappointment. They sounded like every other company at earnings time. They blamed things out of their control: the strong dollar, the economy, and China. They did not take responsibility for what they do control; their pricing strategy. I thought Apple was better than that. I gues that makes me part of the problem. Still using an iPhone 6 and had my battery replaced for $29. Actually they just gave me a refurbiruished phone which I plan to keep using as long as it still works. I’m not a power user, just text, email, phone, casual photography, some music, but nothing that requires the latest technology. i also have older Macs, iPads and Apple Watch. Haven’t spent a dime on Apple hardware in around four years or more. Tim stated China was the main issue, but he also briefly glossed over Iphone pricing and the battery replacement program. This IMHO is what created lower than expected numbers. More people are holding on to their iPhones. Even the carriers are worried because they too are offering more trade in value for upgrades. The other side of the fence has the same issue since premium Android device makers matched Apple’s pricing on devices expecting to make bigger profits. So the world economy HAS slowed down. People are not rushing to upgrade their devices, no matter what they are. The battery program delayed a good number of upgrades that Apple should have foreseen. Now they have to really innovate at a price that will convince customers to upgrade, and work on polishing their OS. Apple’s digital services business is already eclipsing most, if not all of the hardware sales in terms of profitability. These clowns are again months off base with their unsupportable blather. In fact, your a great ad for Apple products when you think about it. Seriously folks, didn't I read somewhere that this will be Apple's Second best quarter ever? It’ll be a good one still, but it’ll be off their guidance. Thus, the “sky is falling” panic sweeping markets. Time for Apple to disrupt another industry. Yeah, that would be nice. They typically do that when the long term trend for a product is falling off. Could be AR glasses (and I still can’t see that as a market bigger than the iPhone and iPad), could be car services or their own vehicle, could even be credit and banking! It depends how you define “best,” but earnings per share (arguably the most important metric) will still be the #1 best ever, which certainly places it among the most profitable quarters for any business in the history of the world, and most likely more than Microsoft, Alphabet and Amazon’s profits combined. Meanwhile, millions of iPhones in China are three months closer to requiring an upgrade. "We are not going to have that debate here. Our outsider’s opinion is that Apple’s business looks incredibly defensible, and while nothing lasts forever, there are no obvious vulnerabilities in Apple’s model right now."